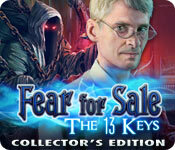 You are the key to solving a chilling supernatural mystery! Death needs help from the only detective he trusts – you! Someone – or something – is stealing the children of Blake’s Mountain! Diva's dark talent claims another victim – can you stop her before the curtain falls? Save your cats and investigate a series of leopard attacks. You’re about to uncover the secret that’s been haunting Blackrow! There's a new sheriff in Meadows Town – and it's you! Can you stop a vengeful Viking spirit before she strikes again? A Mayan god is turning people into jaguars! Can you stop him before the world falls into chaos? Track down the wily Fox’ before he slips away into the beauty of Venice!